It was a tremendous 4 days in the Pacific Northwest in which the Clark Net Impact members got to experience a bit of everything that the area has to offer from the rural feel of the a mountain side home to the forward thinking Mecca that is urban Portland. I could go on and on about the actually sessions I attended, the people I met and the all that I have learned but I fear that I’m still so inspired and impassioned by all of those aspects that I will be relegated to incoherent rambles as I attempt to express all my feelings at once. 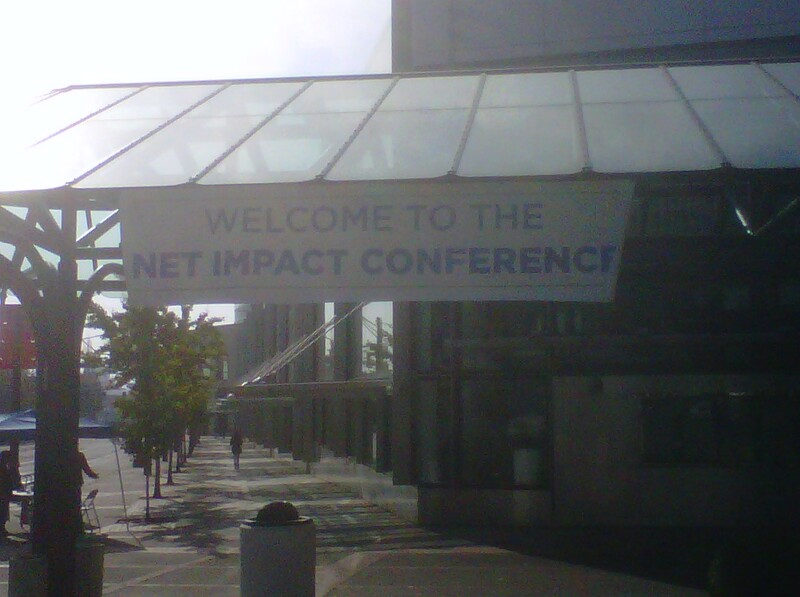 Rather than focus on the content and the quantifiable aspects of the experience, I feel compelled to relay the mental state that the Net Impact Conference leaves me in. The conference was once again a transformative experience for me and many other attendees. More than one fellow conference go-er, when I politely inquired about their last session, would immediately unleash a barrage of adjectives loosely strung together attempting to express powerful emotions. After about my third encounter with a fellow Net Impact member whose uncontrolled stream on consciousness type of response, I knew I needed to update on this aspect of the experience. I’m not an emotional guy, never have been and probably never will be. I have emotions just like everyone but don’t wear them on my sleeve and very rarely express them. But this conference taps into a deep well of emotion and passion that I very rarely work hard enough to explore within myself. The magnificent gift that the Net Impact Conference gives is it’s ability to stir that passion driven part of me into a frenzy and allow it to refuse to be relegated to second class citizen status in my consciousness. making this out to be some sort of turning point for those who attend, but that is not the case. In many ways, we all come away from the conference with many more questions than answers. I didn’t decide what my life mission is and haven’t found a calling. I believe that for hundreds if not thousands of other Net Impact members were able to reset and locate true north in our moral compasses. I don’t have any real answers to the challenges that lie ahead but find comfort in the fact that my compass is true and with each triumph or setback, I know what direction I a heading with each step. This entry was posted in Uncategorized and tagged Boston, Mecca, Net Impact, Net Impact Conference, Pacific Northwest, Portland, Portland Oregon. Bookmark the permalink.